Many online retailers, such as Amazon.com and CD Universe carry the CD. If you prefer digital downloads, check us out at eMusic or at the Amazon Music Download Store or at the iTunes Music Store. Our epic to end all epics. The Moody Blues go Goth. Mistaken Serenity: A second chance fixes everything. Our song with the hardest musical edge. Industrial Pop of a sort. Mistaken Serenity: The Truth will set you free. 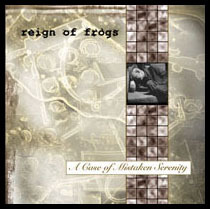 From our edgiest song to our most whimsical...it’s the Reign of Frogs way. Heavily chorused guitars may be outdated, but everything old is new again in our world. Mistaken Serenity: Hit the road and you’ll find what you’re looking for. The Cure meets Mike Oldfield and they go Techno? Mistaken Serenity: The past is more important than the present or future. A trifle of a song, really. Not even a full song. Short, sharp, not-so-sweet. Mistaken Serenity: Being in a relationship makes you more creative. Mistaken Serenity: Just a little more social interaction will cure all your mental ills. Coda. It’s all stripped to the bone, right here. Mistaken Serenity: All you need is right there in your head. More dark Industrial Pop. With a folksy chorus! Mistaken Serenity: Faith is all there is. Mistaken Serenity: I am happier without you. Bombastic instrumental. Alan Parsons is rolling over in his grave. Mistaken Serenity: The world ends in bangs or whimpers. Teasingly subtle instrumentation, singalong chorus. Low-key but biting. Mistaken Serenity: Hard work is its own reward. The instrumental soundtrack to a movie of a life of despair. Mistaken Serenity: Depressing music can’t be uplifting. A minimalist rumination set to a slow steady beat. Mistaken Serenity: It would’ve turned out differently.